The EZ-Access Rubber Threshold Ramp is designed for doorways and raised landings to make entry and/or exit convenient and safe. Ramp simply sits against the doorsill (inside or outside) to provide a smooth ground to sill transition and is especially practical for sliding glass doors because it does not interfere with the door track. The EZ-Access Rubber Threshold Ramp can be used by itself or in pairs side by side for wider entry. Also if the rise is higher than 2-1/2 inches, two ramps can be combined with optional 2-1/4" risers to accommodate up to 4-3/4" rise. Ramp can also be trimmed back to accommodate less than 2-1/2" rise. EZ-Access Rubber Threshold Ramps are ADA approved, slip-resistant and designed for years of continued use. Its 2-1/2" height can easily be trimmed for lower heights and narrower widths to fit any entrance or threshold. Standard width is 48" (for wider entrances, simply place 2 ramps side-by-side). For higher thresholds up to 4-3/4", two ramps can be combined with optional 24" square rubber risers. 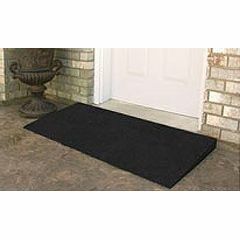 Made of 100% recycled tires, The Rubber Threshold ramp is ideal for indoor and outdoor use and because the ramp is fully portable, it provides the ability to move it to another door or location if desired. Made in the USA. Product height 1/4" to 2-1/2" 2-1/4"
Determine the Proper Ramp Length for Your Needs Click here for a handy incline chart. Want a more aesthetic looking ramp? EZ-Access Rubber Threshold Ramp with Beveled Sides. Easy to Install. Safe. Functional. It is a very sturdy and heavy rubber mat - It works great wheeling my Dad's bed in and out of the back door - as, when I don't have a CNA to help me transfer my Father to a wheel chair - This allows me to wheel his bed out the back door, so he can be in the sunshine and fresh air! It helps me save my back from trying to get the bed over a 2 inch lip, back into the house - which I have tried to do before and caused a great deal of back pain on my end - So, it works great, but is pretty heavy - and if you are elderly, it might be too heavy for you to lift and place on the door mat area. I would like to buy a wheel chair access ramp for our front door - width: 32", height 5 1/2" - which product# do you recommend? Is the Thr250-1 EZ Access Rubber Threshold Ramp System easy to cut it down to a 2" height or can you order a 2" height one?